Is it me? (Well, quite often I think it probably is), but I’m just asking, where do you make your art? Do you have a studio, or would you like to have one? Making needlepoint artwork doesn’t really lend itself to the traditional studio. 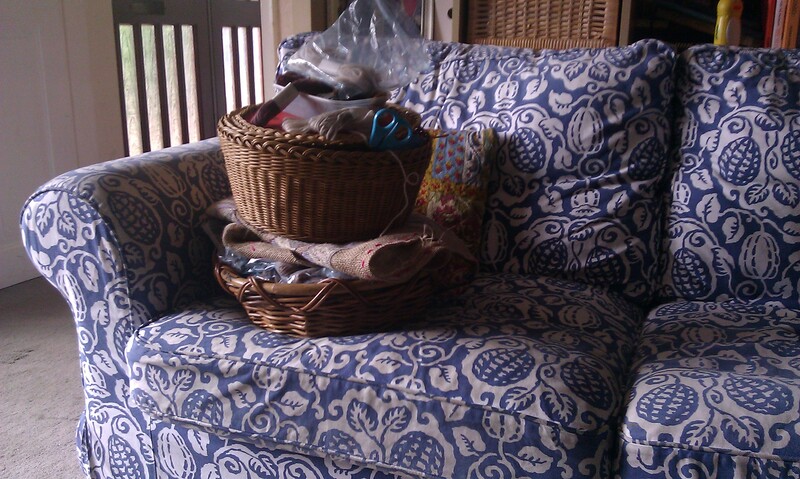 I do most of my stitching, sitting or lying on the sofa. I move around quite a lot, depending on whether I’m using a frame or not and how big the piece is that I’m working. I quite often sit with my legs up on the sofa, using my knees as a kind of frame – but it really depends on where on the canvas I’m sewing. I do have a big floor frame, which my dad made for me years ago, but I rarely use it. I don’t like bending my neck over, and I just feel more comfortable sitting somewhere soft and comfortable. Oh and the other thing is, I like to work where it’s warm – I go quite cold sometimes, so I prefer to work where the heating is on, or in the window if the sun is shining. But all that being said, I just love looking at other people’s studios. It feels a bit naughty, a touch of the voyeuristic, but it’s so exciting to see how other people organise their working areas. Some seem very utilitarian, others are more a work of art in their own right. There are even magazines that feature artists’ studios – (although I haven’t yet resorted to buying them). Our local area is having an open studio month – you can drive around and go in to see where artists are working – but could I go? Would it feel as if I was snooping? Would it be like those people who visit houses for sale, just to see what they are like inside and with no intention to buy? I’m especially intrigued by textile artists’ studios. These seem to be a deliciously guilty mix of art studio and sewing room. 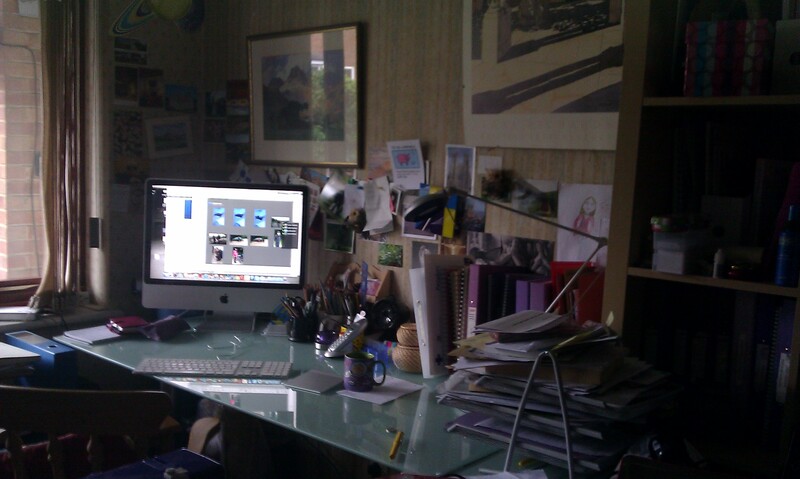 So to all of you who publish pictures of your work space – THANK YOU. It’s inspirational, but I can’t quite work out why or how – it just is. Hands up here as a Studio Tragic…I LOVE all those studio mags, I do the Open Studios AND I take heaps of photos – all the artists I have photographed in their creative spaces do not mind one bit. I attended the seminar launch of a huge book called “Studio”, which also included a DVD on the working habits, spaces, the creative nature etc of 61 artists. It is one of my favourite books. Inspiration is out there everywhere! Lovely post. I do not have a studio, not even a spare room for my work. i have tried stitching while sitting on a chair or a sofa, but it is just too uncomfortable for me. I do nearly all my stitching sitting at a large table in our living room. It is right by a large window which lets in lots of light and sunshine. It would be lovely to have my own space, but it is just not going to happen. As regards Open Studios, I like visiting them and we have lots of them up here. Alas none are needleworkers. Still it is fascinating to see the work spaces of real artists.